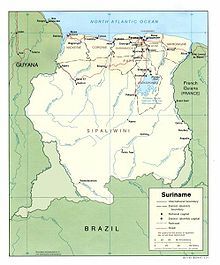 Suriname – sovereign state on the northeastern Atlantic coast of South America, and the smallest country on that continent. It was long inhabited by indigenous tribal peoples with diverse cultures, before being explored and contested by European powers from the 16th century, and eventually coming under Dutch rule in the late 17th century. In 1954, the country became one of the constituent countries of the Kingdom of the Netherlands. On 25 November 1975, the country of Suriname left the Kingdom of the Netherlands to become an independent state, while maintaining close economic, diplomatic, and cultural ties to its former colonizer. Suriname is the only sovereign nation outside Europe where Dutch is spoken by a majority of the population. ^ "Suriname". The World Factbook. United States Central Intelligence Agency. July 2, 2009. Retrieved July 23, 2009.